In our homes, we often spend hours tuning, updating and personalizing the sound that comes out of our home stereo systems; this can mean upgrading your Bluetooth speaker system, investing in a high-tech receiver, or installing 5.1 surround sound – because music is a big part of most of our lives. From listening to the morning news, to throwing on a favorite playlist while you prepare dinner, music seems to be integral to making a house a home. But what about your car stereo? You probably spend more time in your car listening to music, yet few people give the car stereo a second thought. 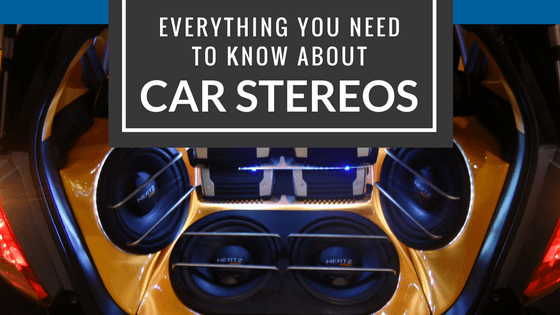 In this post, we’ll decipher the need-to-know facts behind upgrading and tuning your new car stereo, from the tech features you want, to the necessary components for the best sound. For many automakers, stereo’s come closer to the bottom of the totem pole so a beefed up audio system doesn’t become standard equipment until you explore the higher end trim levels, or a premium luxury brand. Replacing your stock system will inevitably improve the sound of your stereo, so what’s it going to take? It’s a relatively easy job to remove and install a new deck or head unit – yet in some cars you may have to remove a portion of the dash as well. In these situations it’s important to consult with your approved vehicle maintenance provider to ensure you don’t void any warranties. Some of the benefits of an up-to-date head unit include more power for cleaner sound and better bass response, better AM/FM reception for more stations and less drift, more tonal controls that allow you to customize your preferred sound and overall improved entertainment options like Bluetooth connectivity, auxiliary ports, USB inputs, navigation, satellite radio, MP3 players, and incoming call capabilities. The head unit of your new system is the beating heart of your upgrade. Aside from power and capability, it’s often a driving force behind cosmetic and aesthetic upgrades as well. Ask yourself a few questions before going shopping for a new deck and find out what size will fit in your make and model- is budget more important than quality? What are your overall plans for your new stereo? How do you use your stereo now, and how are you planning to use it in the future? In reality, you can spend just about whatever you wish – the sky is the limit. As a general rule, to improve sound quality while doing little to your speakers means spending a little more on a head unit, as lower end models tend to lack a high quality built-in amplifier. Think about the importance of a CD player in this modern day – do you still listen to your old CD collection, or have you positioned your stereo experience to that of a digital MP3 age? Also, think about the ease of use you need while driving; a complicated and seemingly unfriendly user experience can make you wish you’d left the stock deck in the dash. Look at the effectiveness of layout, touch-screen specifics like size and location, as well as responsiveness. In most vehicles, the speakers will be simple paper cones that produce sub-par sound quality. There are a few things to consider when looking at new speakers, which will vastly improve the sound of your car stereo – if you’re going to spend a few extra bucks, it’s a good idea to do it here. Five key factors for speaker shopping are: component vs coaxial, size, sensitivity, power handling and build quality. Component speakers typically produce better sound, but they’re more expensive. Coaxial, or full spectrum speakers are easier to install, and are readily available. Unless you’re an audiophile, they’ll do the job just fine in regards to sound quality. Take a good look at the sizes of your car’s stock speakers in the user manual. A mechanic of stereo installation specialist can also help you to make the right decision in replacing or increasing the size of your speakers. In most cases, replacing the stock size without making big structural changes to your vehicle is more than enough to improve your sound quality to that of an AOK listening experience. Power handing means how much power your speakers can tolerate coming from the head unit or external amplifier. Measured in watts, power handling refers to the amount of energy you can put through your speakers. If you haven’t chosen a new head unit, you have a little more freedom, as power won’t have increased. Build quality and sensitivity go hand in hand. Look for quality materials in the construction of your speakers like rubber surrounds, stiff lightweight woofer materials like polypropylene, or metal-coated synthetic fabrics – they’ll last a long time and provide great bass. Sensitivity refers to how much power your speakers have to be able to interpret to achieve a certain volume level. Typically, no – but there’s always an exception. Usually, car enthusiasts believe that warranties will become void if they undertake any type of modification – but this is usually only true if the automaker can prove that the aftermarket part in question caused the need for repairs. It’s important to seek guidance with your local vehicle dealership in these cases. This can be argued for an aftermarket engine part, like a turbocharger, intercooler, or exhaust system, even cosmetic alterations like brake lights or window tint – but a properly installed car stereo will have very little to do with any damage caused to your vehicle. Trust your decision to your local dealership salesperson or licensed mechanic prior to doing any work to your vehicle as a precaution. Further, have the work done by a qualified stereo installation technician rather than doing it yourself in the driveway. While it may be tempting to do the work yourself, if you’re worried about a warranty issue for whatever reason – make sure a knowledgeable, experienced person is taking on the job for some piece of mind.